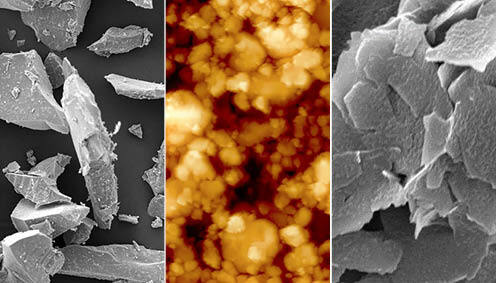 Do you need to look at the nano or microscale structure of a surface or a material? Perhaps you need to map how different elements make up the surface or the material? Do you have biological materials which you need to look at with a high power microscope? Nottingham Trent University is funding a pilot project to increase its engagement with industry. The project will allow our experts to work with you and to establish a commercial relationship to obtain your future analytical needs. This pilot is focussed on advanced imaging but there is also an extensive suite of state-of-the-art analysis tools available. Olympus Microscope BX51 (Magnifications: 2.5x to 100x; Filters: DAPI, Bright field, Red, Dark field). ScanAsyst, PeakForce Tapping, TappingMode (air), Contact Mode, Lateral Force Microscopy, PhaseImaging, Lift Mode, MFM, Force Spectroscopy, Force Volume, EFM, Surface Potential, Piezoresponse Microscopy, Force Spectroscopy; Optional: PeakForce QNM, HarmoniX, Nanoindentation, Nanomanipulation, Nanolithograpy, Force Modulation (air/fluid), TappingMode (fluid), Torsional Resonance Mode, Dark Lift, STM, SCM, C-AFM, SSRM,PeakForce TUNA,TUNA, TR-TUNA, VITA. The FE-SEM consists of a high resolution field emission electron column. This allows for high magnification and resolution imaging using electrons. The unique high power optics of JSM-7100F guarantees 1.2nm resolution. High magnification for the study of nano-structures is easily obtained. Magnetic specimens The objective lens of the JSM-7100F does not form a magnetic field around a specimen. Magnetic specimens can be observed and analysed without restriction. Analysis of nano-structures A small probe diameter is obtained with the patented aperture angle optimising lens. You can acquire high precision analyses and high quality elemental maps in a short time by using a large probe current. 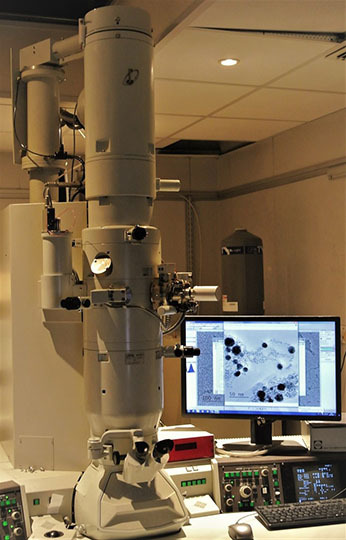 A variety of analytical equipment including EDS, WDS, and EBSD can be mounted for their ideal geometry. Clean vacuum A specimen is introduced through the specimen exchange airlock chamber. The specimen chamber is always kept in a clean, high vacuum. 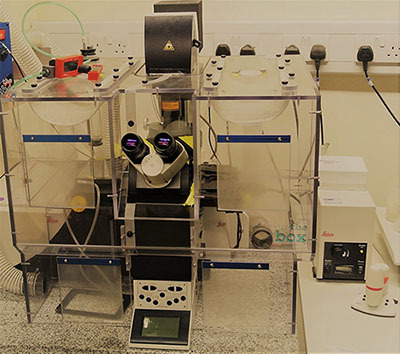 The unique one-action specimen exchange mechanism lets you insert and remove a specimen with simple operation. The specimen chamber is pumped with a TMP. In-lens thermal FEG The patented in-lens thermal FEG is efficient and produces a maximum probe current of 200nA. Typical Applications Observe the finest structural morphology of nanomaterials at 1,000,000X magnification with sub-1nm resolution. Collect large area EBSD maps at low magnifications without distortion. 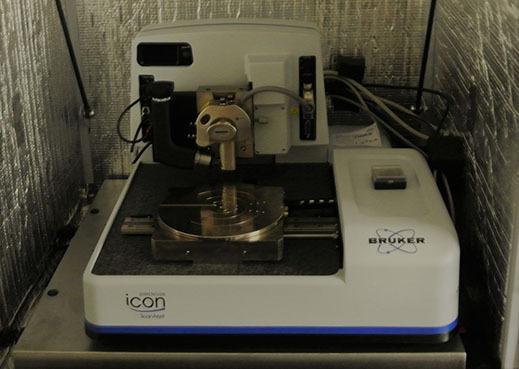 Perform low kV imaging and analysis of highly magnetic samples. Large area EDS (EDX) is available for chemical composition analysis. Low Vacuum operation capability. Electron optics system Illumination system includes the electron gun and condenser lens. 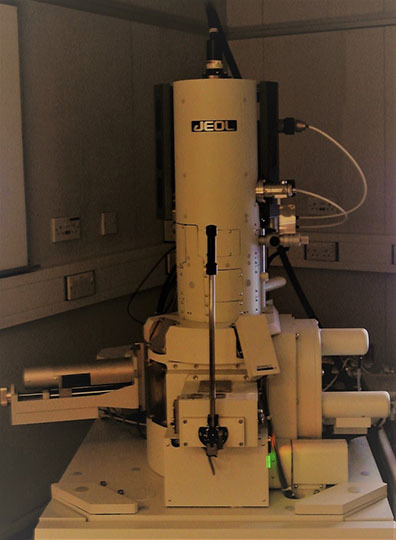 The electron gun (multi-stage beam stage) is a standard self-biasing LaB6 filament. The condenser lens system is four stage condenser lens: 1st, 2nd, 3rd, and mini-lens.The condenser aperture sizes are 10, 20, 50, 70, and 120 µm in diameter. The imaging forming system includes an objective lens, 1st and 2nd intermediate lens and a projective lens. The ultra-high resolution (UHR) pole piece is used in the objective lens. The objective aperture sizes are 20, 40, 60 and 120 µm in diameter. SAD aperture sizes are 10, 20, 50 and 100 µm in diameter. In Low-Mag mode, the objective lens is turned off and the objective mini-lens is active. Specimen stage Specimen holder is exchanged with airlock mechanism with two stage evacuation. X, Y, Z and X tilt are all motor-driven. The movement range of X and Y directions is ± 1 mm. The specimen tilt angle is ±15º for both X tilt and Y tilt. Vacuum system It includes an oil rotary pump, an oil diffusion pump, and a sputter ion pump (SIP). The diffusion pump is for pumping the specimen chamber and the camera chamber, and the SIP is for the pumping the column and gun chamber. Dr Enzo Fornari, School of Science and Technology, Nottingham Trent University.